The green iguana is wide ranging and can be found from Mexico through to Central and South America. They are seen as invasive animals in southern Florida and Hawaii. They live in humid, tropical rainforests, and prefer to live high up in the tree canopy. Green iguanas have a white photo-sensory organ on the top of their heads called the parietal eye (also called third eye), in contrast to most other lizards that have lost this primitive feature. It can detect changes in light and movemnet which helps the iguana detect predators stalking it from above. 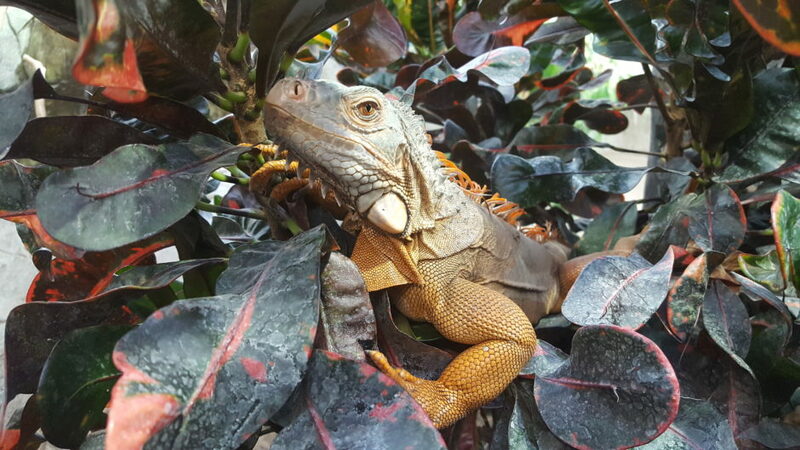 Sometimes green iguanas are not green, the green iguana at the Living Rainforest is in fact red! It is common in the pet trade to selectively breed animals with more desirable traits, and artificially create different colour morphs. This can cause issues with the captive population of the species, as it often involves in-breeding. The large flap of skin under the chin is called a dewlap. It is larger in males than females and serves many purposes. It is used for communication, threat displays, and heat absorption and dissipation. Although considered least concern by the IUCN Red List, they do suffer from habitat loss and fragmentation. They are also hunted for their meat and eggs, as well as being hunted for the pet and leather trade.